April brings bass, walleye and catfish for Texas anglers. With warming water in late spring, wading in streams to fish becomes more comfortable. 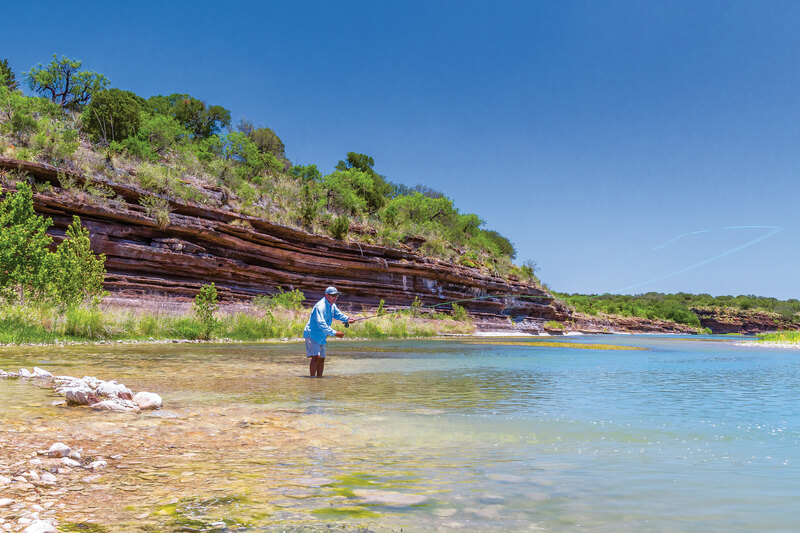 Texans have a unique opportunity to catch Guadalupe bass in many Hill Country streams; these bass are a favorite fly-fishing target. We might hesitate to recommend fishing the Llano River for these feisty bass because of last fall’s devastating flood, but these native species have been through changing environmental conditions for thousands of years. While it’s hard to predict the short-term impact, fishing could get even better in the next few years. Fish can survive high water by finding shelter behind rocks and debris or moving way up the floodplain. On a good note, the flood cleared sediment from rocky and gravel areas to create better habitat. Fishing is best when the water is clear because Guadalupe bass are prolific sight feeders. Fly fishermen use crawdad-imitating flies with great success. Slower, deeper pools hold fish, but feeding bass will move to riffles and wait for their meals to come to them. TPWD will be assessing the fish populations affected by the flood. In the meantime, anglers are encouraged to conserve until more is known. Yes, you read that right. One of the best-tasting freshwater fish, walleyes are something unique for Texans to experience. 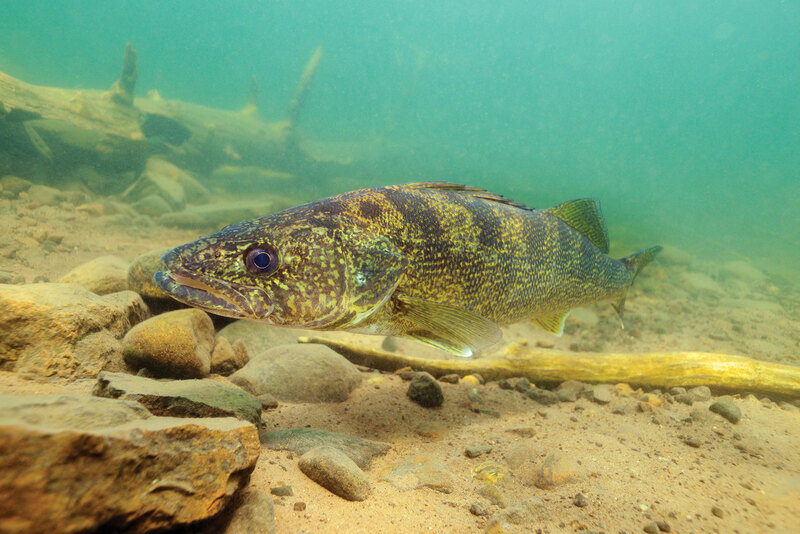 Walleye spawn early in the year, usually near moving water and rocks, such as inflows or where wave action causes current. For the majority of boaters, however, fishing begins to pick up around late March and begins to slow down by mid- to late June as the fish begin moving into deeper water. Anglers do well trolling or casting shad-imitating lures when the fish are shallow. During a span last spring, a local angler reported catching about 750 walleyes, harvesting 45 with the smallest measuring 22 inches. Walleye hang around rocky shores, which is the majority of the lake. Another great walleye catching technique is slowly dragging a small jig (try a quarter-ounce phosphorescent color) tipped with a night crawler along the bottom. The jig/worm can be effective when the fish go deep by using a slow, vertical jigging technique. Lake Meredith went through drought in 2013 and toxic golden algae blooms in 2010-14. Heavy rains in 2015-17 brought the lake level up. TPWD began restocking prey fish in 2015 and then walleye in 2016. The walleye have been growing well and are expected to be in the 18- to 25-plus-inch range this spring. Lake Conroe is one of the freshwater lakes where all angler interests are met. Bass get a lot of attention because many high-profile tournaments have been held here, and the tournament bass caught here are impressive. The nonprofessionals are not so eager to show off their catches, but there are occasional news stories or rumors of giant bass. Bass fishermen need to spend time to learn the locations of the offshore brush piles, but they can get started by fishing the numerous docks, bulkheads and retaining walls. Many bass are caught in the marinas as well. TPWD and partners have conducted numerous habitat improvement projects, including artificial structures and vegetation restoration. The size of catfish in Conroe is pretty impressive, too. 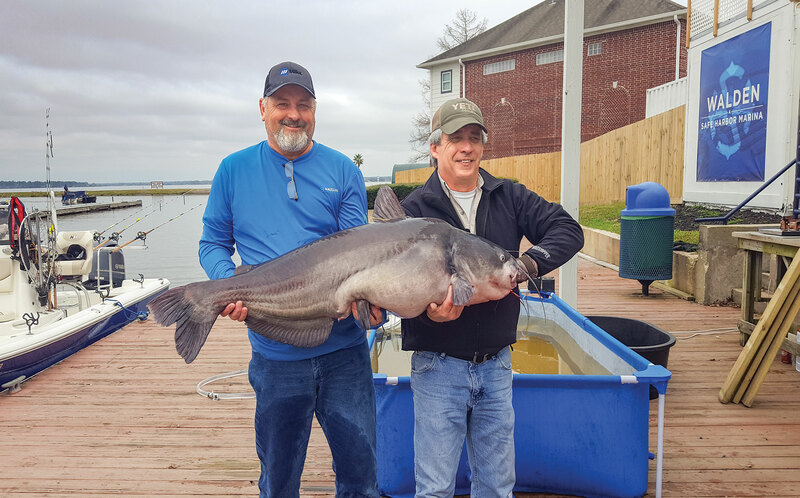 Recent catches include several giant blue cats weighing more than 30 pounds, with one at 60-plus pounds. Crappie fishing is also pretty decent here if you target brush piles and marinas.